Independent research is a fundamental element of a Level 8 degree. The level descriptors for a Level 8 qualification set down by the National Qualifications Authority of Ireland require the learner to “use and modify advanced skills and tools to conduct closely guided research”, “to learn to manage learning tasks independently, professionally and ethically” and to “transfer and apply diagnostic and creative skills in a range of contexts”. The undergraduate dissertation, or “capstone project” as it is referred to in the United States, is an ideal vehicle through which students develop and apply these skills. The Report of the National Strategy Group on Higher Education in Ireland (2011) recognises that teaching in higher education is distinguished from teaching at other levels by its focus on the integration of research with teaching and learning. It points out that this integration can take many forms – teaching and learning can be research-led; it can be research-oriented; it can be research-informed and it can be research-based. In the case of the latter, the curriculum includes activities in which students themselves conduct research through dissertations, projects or other independently carried out course work. The undergraduate student dissertation is now a standard requirement of a Level 8 degree in Ireland. It places new and additional demands on students and on their teachers and requires a level of confidence and expertise on the part of teachers as supervisors for which they may not have been prepared. 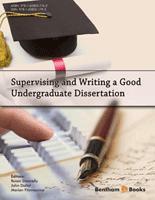 This eBook will therefore be particularly welcomed by novice undergraduate supervisors but it will also be welcomed by more experienced supervisors as it addresses so many aspects of the supervision of undergraduate dissertations. There are chapters on choosing a research topic; on honing and refining research questions; on identifying the most appropriate methodologies for the study in question, and on the moral and ethical issue which will be encountered both by students and supervisors. The contributors have all been supervisors themselves and their advice comes from many years and decades of hard-earned experience. Their chapters address the personal, psychological and emotional issues that will inevitably impact on the student-supervisor relationship and emphasise the importance of empathy and sensitivity on the part of the supervisor. Readers should remember their own early forays into the world of research and the insecurity and apprehension that enveloped them at that time. The central role of the supervisor in providing support and reassurance should never be underestimated. At the same time, the supervisor plays a central role in ensuring that high research standards are maintained and that the research is carried out with rigour. The editors of this eBook, Roisin Donnelly, John Dallat and Marian Fitzmaurice, are to be congratulated on bringing together so many prestigious and experienced supervisors who have generously shared their expertise and experience in their chapters. Some of them are already well-known and are widely-published. They come from all corners of the globe – the U.S., Australia, and elsewhere. Others may be entering the publications field for the first time but this does not in any way take from the value of their chapters. The eBook was a formidable undertaking – no less than twelve chapters, many of them over thirty pages long. I am very happy to endorse this collection of essays and to recommend it to the thousands of academic staff who find themselves every semester supervising undergraduate dissertations in colleges and universities throughout the world. I also commend the editors on their vision and future-oriented approach of making this publication available in eBook form, thereby ensuring its availability to a very wide audience. I wish the editors, the contributors, and readers–whether supervisors or students–the very best in their endeavours and I am confident this eBook will help to smooth the path of undergraduate researchers in the years ahead. This eBook is about charting a course for students at undergraduate level to be successful in writing their dissertation or project. Alongside this, it is primarily a support for academic staff who have a supervision role at undergraduate level, especially those who are new to this in their career. It also has wider readership potential for Masters Level supervisors as many of the same supervision and academic writing issues extend to both sectors. Some of the key issues that have emerged in the literature on supervision at undergraduate level are relevant to the case of Masters research supervision also. Important factors for the supervisor of both levels exist such as avoiding conflict of interest between themselves and their student, as well as experiencing the possibilities of both variable workloads and quality of supervision. This is especially important as the number of students being supervised is on the rise, and the ability of individual staff to carry out their other duties is becoming more constrained which can result in less time being available for supervision of each student and the quality of their supervision perhaps suffering. Therefore it is a very useful online resource for all supervisors to have on their desktop/laptop as it provides useful insights into ways in which students can be assisted with writing, as well as being a very useful and flexible starting place for all students to have as they write. There are chapters in the eBook from around the world, and from different disciplines and contexts, so it is instantly obvious that writing and supervising a good undergraduate dissertation is a global challenge, and this eBook can help meet it! We believe this eBook is necessary as there are many texts available today to help Masters and Doctoral students write their thesis, and further work oriented at supervisors at these levels, to provide guidance, support and pedagogies for the postgraduate research supervision process, but the undergraduate student and supervisor seem to have been neglected along the way. We are supervisors ourselves and so are all the contributing authors; so this eBook is written by supervisors and for supervisors! The examples and exercises provided in many chapters will be helpful in addressing problems that can arise in both the writing and supervising of an undergraduate dissertation or project. In the Introduction chapter to the eBook, our research on this topic with academic staff from Irish higher education is discussed. This formed part of the impetus for creating the eBook. The style and content of the chapters is pragmatic, and aims to provide clear and sensible guidance to enlighten students in their writing and supervisors in their role and across the disciplines. It would also be a useful guide for staff involved in supporting supervisors in the complex task of research supervision. This is a very practical text with tips and hints for students, supervisors and examiners, and scenarios that illustrate the points being made. In many cases, the practical advice offered in the chapters is based upon research projects undertaken by the very experienced authors. The advice consists of highlighting solutions that others have found helpful, and which may also work for you. The research underpinning this eBook then provides a sound basis for the comments and suggestions made throughout the work. It has a wealth of advice and we hope it also makes for an enjoyable read! A WORD ABOUT THE CONTRIBUTING AUTHORS This eBook draws together the shared expertise of a number of very experienced supervisors from higher education institutions in Ireland, UK and the USA. This is an edited volume that brings together 12 chapters by 15 supervisors. Although the eBook has been organized into 12 chapters exploring both the supervisor and student perspective, it should be noted that the advice and recommendations presented in each chapter can be useful for both parties in the supervisory relationship. The supervisor perspective is presented in Chapter 1 by Gina Wisker: this is especially useful for the first time supervisor, as it looks into roles and responsibilities, supervisory expectations and interactions, as well as offering research and experience based ideas for good practice in supervising undergraduate dissertations and projects. Neil Haigh’s chapter is helpful for students when they are setting out to conceptualize a research project. As well as providing an easy-to-follow framework to support students through the various stages of the research process, it outlines practical suggestions and observations from the author’s own extensive experience as a supervisor. Closely related to this, Amanda Dillon’s chapter presents a valuable empirical study of the undergraduate student’s own expectations of the dissertation and follows their journey through the process. The key ethical issues regarding supervision are fully explored in Richard Miller’s chapter. Developing staff and student understandings of ethics in undergraduate research is as prevalent today as it ever was. The chapter by Moira Maguire, Brid Delahunt and Ann Everitt-Reynolds also explores the role of ethics in research but the principles that guide ethical decision-making are initially outlined and their application to each stage of the research process is subsequently discussed. This discussion is further enhanced through the provision of expert tips and the use of audio clips from students illustrating how ethical issues can be managed within projects. Charles Buckley’s chapter discusses the growing phenomenon of supervising international students, and explores some of the key challenges facing supervisors as well as presenting a number of practical solutions. The chapter by Vicky Gunn revisits how the undergraduate dissertation in the Arts and Humanities is placed within the whole of a programme. It is presented from the perspective of changes to the nature of being an early career researcher. The chapter aims to provide a starting point for a discussion about how to redesign undergraduate dissertation processes in such a way that students are enabled to play to their strongest researcher orientations. The next two chapters explore the crucial role of academic writing in the undergraduate dissertation process. Nancy Hensel and Lindsay Currie examine the relationship between undergraduate research and the training necessary for effective writing, with a special focus on the importance of the faculty mentor. This chapter also focuses on the need for students to be clear about the purpose of writing and addressing different audiences. Sarah Moore’s imaginatively titled chapter is presented for the student’s perspective and also affords supervisors the valuable opportunity to look closely at how they support their own students in the academic writing process. It emphasises how important it is to pay attention to the emotional dimensions of writing, both positive and negative. Within this, she highlights the paradoxes that exist within the process of academic writing and reviews the common advice that students can be presented with to support them in their writing pursuits, and examines how this advice might not always have the intended desired positive effect. Taken together, both chapters explore issues of general concern to supervisors and offer practical approaches to the teaching of writing which can be used in both study/writing support sessions and within disciplinary contexts. The remaining three chapters consider the important role of supporting the student through digital literacy with the use of relevant learning technologies: Online Communities of Practice to support students in the dissertation process are discussed in the chapter by Linda Clarke; how YouTube Resources can help with information overload and the need for development of critical awareness is explored in the chapter by Ziene Mottiar and ePortfolios (self-regulation and personal development) are presented in the final chapter in the eBook by Brendan Ryder. Finally, we, the editors, wanted to take this opportunity to thank the contributing authors to the eBook, and acknowledge the Editorial Advisory Panel for their help in the review process of the eBook, without whose support the project could not have been satisfactorily completed. So, our sincere gratitude is extended to all those on the Editorial Advisory Panel who provided constructive and comprehensive reviews. We hope you enjoy the contributions in the eBook from all the authors who shared their expertise with us and the wider supervisor and student community in undergraduate education.